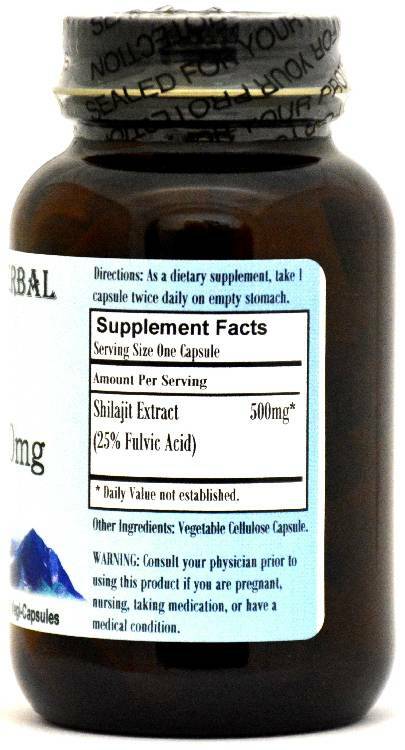 Barlowe's Herbal Elixirs brings you a high potency 25% Fulvic Acid Shilajit Extract. In Ancient Sanskrit, Shilajit means "conqueror of mountains and destroyer of weakness" and its use is said to strengthen the body. Bottled in Glass! No Stearates! No Fillers! No Junk! 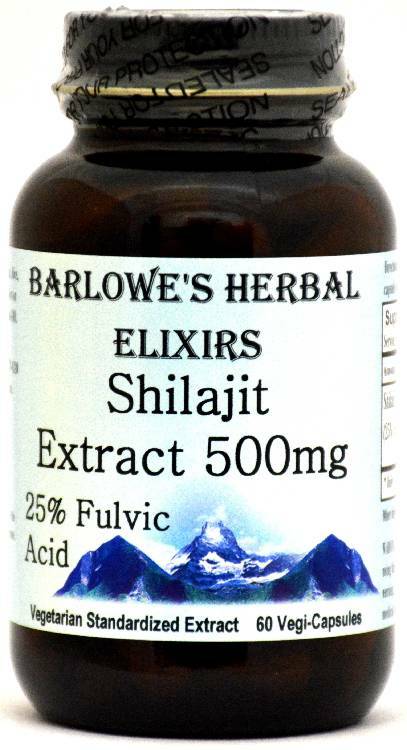 Barlowe's Herbal Elixirs brings you a high potency 25% Fulvic Acid Shilajit Extract. 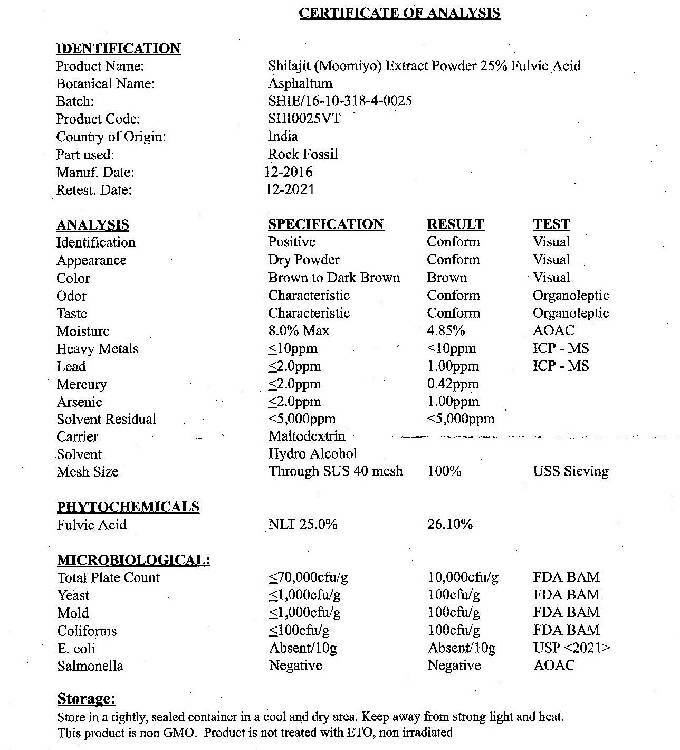 The Shilajit Certificate of Analysis (COA) for this particular batch is shown above. Shilajit has been used in Indian Ayurvedic Medicine for millenia to strengthen the body. In Ancient Sanskrit, Shilajit means "conqueror of mountains and destroyer of weakness." Bottled in Glass! No Stearates! No Fillers! No Junk! Shilajit is composed of humus and organic plant material that has been compressed by layers of rock in the high mountains of the Himalayas. Shilajit, also known as Mineral Pitch or Black Asphaltum, is a rich source of natural-occurring minerals. Shilajit has been widely used in India, Tibet, and other countries of the region to tonify the immune system. It is a form of mineral that drips from the cracks of the rocks during hot weather. It is the decomposition of the plant matter in the rocks deposited centuries before. The bio-transformed plant matter is extruded from the rocks by geothermal pressures. It is collected in raw form and then purified and extracted. Shilajit is said to increase the core energy responsible for sexual and spiritual power - the same force that is reduced by stress and anxiety. Shilajit is said to renew youth and vitality. It has been used historically for general physical strengthening, anti-aging, libido, healing, enhanced brain functioning, and many other ailments. Caution: Barlowe's Shilajit Extract is potent and should be utilized with care. This product is for dietary use. If side-effects occur, discontinue use immediately! The above statements have not been evaluated by the Food and Drug Administration (FDA). This product is not intended to diagnose, treat, cure, or prevent any disease. Directions For Use: Take one capsule either once or twice a day without food. Generally, it should be utilized for a period of around two weeks, then discontinued for approximately a week. These cycles of use (and disuse) can be continued indefinitely unless side-effects occur. Results and usage amounts may vary based on body type and weight.